The Gold Coast's entertainment center, Surfers Paradise is everything you're looking for in a great holiday vacation to Australia's Gold Coast. With a population under 20,000 people, the area isn't as crowded as Broadbeach and Southport, either, so you won't have to worry about battling crowds when you choose to stay at this great area of the Gold Coast. 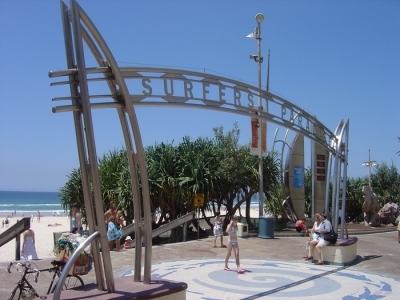 Getting out and about around the parks in the area is another great way to spend your days in Surfers Paradise, and you'll also be right on the Federation Walk trail. Renting a scooter or bike is another fun way to see the area, and get a little of that ocean breeze in your hair. And if you want to try getting out on the water, but stay dry in the process, there are plenty of great boat hire options for you to choose from. Shopping won't be a problem at Surfers Paradise, especially with the world class shopping malls and department stores. Try one of the newest, High Street, which has an amazing variety of designer and boutique shops. Chevron Renaissance Shopping Center will also have just about everything you're looking for, but if they don't, try Centro Surfers Paradise. Food will be on your mind quite a bit when you're constantly passing scrumptious and mouthwatering restaurants. Whether you want a local taste for lunch or dinner, or something a bit more international, Surfers Paradise will have everything to meet your needs. A Carne Churrascaria is a great place for some Brazilian cuisine, or perhaps you'd like Bavarian Haus for German. Modern Australian dishes are also easy to come by at such great restaurants as Northcliffe Surf Club and the Surfers Paradise Beach Cafes. Begun in 1877 as an 80-acre farm, the area proved inhospitable to crops, but not visitors, who began trickling into the region in the early 20th century, and haven't stopped since. The same beautiful conditions and great weather that attracted the settlers of yesteryear still draws millions each year to this scenic playground, and you'll have lots of entertainment, shopping, and dining options when you choose to visit on your holiday. If you've been waiting to grab a board and catch a wave for some time now, check out Cheyne Horan Surf School. Founded by the legendary Australian surfer, Cheyne Horan will have you standing up on a board in no time, and then they'll quickly get you into the water to try it for real. Go Ride A Wave is another great school that caters to beginners and accomplished surfers alike.